Carter’s My Plumber volunteers every week to feed the homeless in Indianapolis at Wheeler Mission. 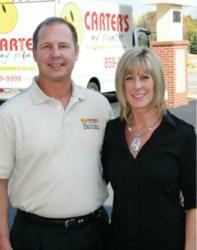 Carter’s My Plumber is a local plumbing company serving the Indianapolis Metropolitan area. We serve people every day through our plumbing business, but sacrificing a few hours to give back to those in desperation keeps us coming back. Carter’s My Plumber is volunteering this summer at Wheeler Mission in Indianapolis to feed the homeless. Wheeler Mission has both a men and women’s shelter in Indianapolis. They provide breakfast, lunch, dinner, showers, clothing, chapel services, and medical, dental and case management services. They provide meals 365 days per year, serving over 300,000 meals every year. Wheeler Mission: Help. Hope. Healing. Carter’s My Plumber is a local, family-owned, 3rd generation plumbing business located in Greenwood, Indiana, providing plumbing service to the Indianapolis, Greenwood, Whiteland, Franklin, Bargersville, Trafalgar, Mooresville, Wannamaker, Beech Grove and Southport areas. Carter’s My Plumber has a special menu of services designed to meet the needs of every homeowner to provide a complete solution to their home’s plumbing system. With over 30 years of plumbing experience, their trained plumbers meet the plumbing need of every residential and light commercial need. The Carter’s are involved with other organizations such as water.org, Light the Night through the Leukemia & Lymphoma Society, and the World Plumbing Council. Jamie encourages a young man at the homeless shelter Carter's Care Bug at Lighthouse Mission Kelson Carter, Plumber & Bridgette Hardamon, Marketing Intern serve lunch to the homeless Lisa Carter, owner, and Bridgette Hardamon, Marketing Intern, serve lunch at Lighthouse Mission.